Khet Udomsak Sub-district residents commemorated HM the Queen’s Aug. 12 birthday by launching a community cleanliness campaign. Mayor Pairoj Malakul Na Ayutthaya opened the Aug. 4 event to make merit and express loyalty to Her Majesty for national Mother’s Day. The event is aimed at keeping both land and marine environments clean, tidy and beautiful, allowing nature to develop. Representatives from the sub-district’s 13 communities, civil servants and military personnel from the Air and Coastal Defend Command participated. 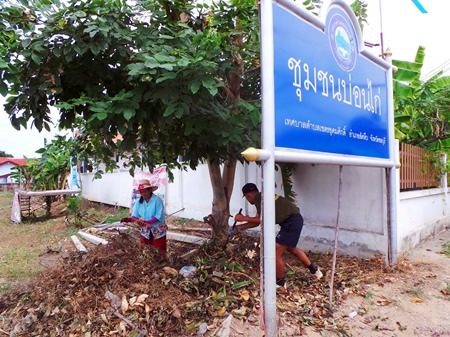 Residents break out the rakes and brooms to clean up Khet Udomsak Sub-district in preparation of HM the Queen’s Aug. 12 birthday.